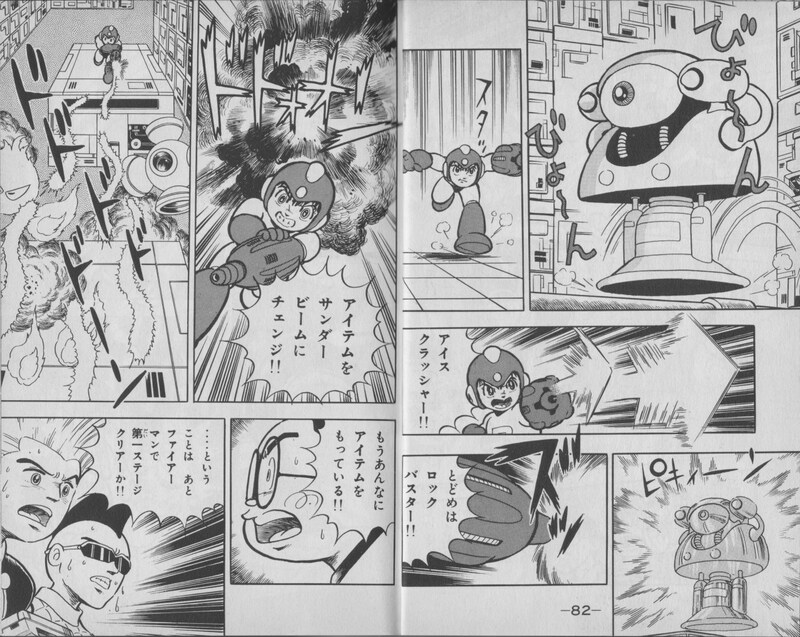 The continuing adventures of Shigeto Ikehara’s Rock’n Game Boy in Rockman World. When we left off last week, Hajime was first to clear the Cut Man stage, despite some tough opposition from BUG’s Bit Benders. Realizing they need to step up their cheating routine, the Bit Benders conspire to split up within a single game zone. This way, they can clear all the remaining stages at once, rather than everybody competing on the same level in different game zones. Everyone probably should have been working as a team in the first place, but nobody ever claimed these kids were master strategists, just Game Boy enthusiasts. Here to remind everyone they’re still a part of the story, the other Rock’n Gamers converge on the Elec Man game zone, running interference by keeping the Bit Benders out of Hajime’s helmet hair. In a fine example of what Ikehara calls “game guide manga”, the Gamers demonstrate several strategies for navigating the Elec Man stage. They were doing pretty well, right up until the boss. 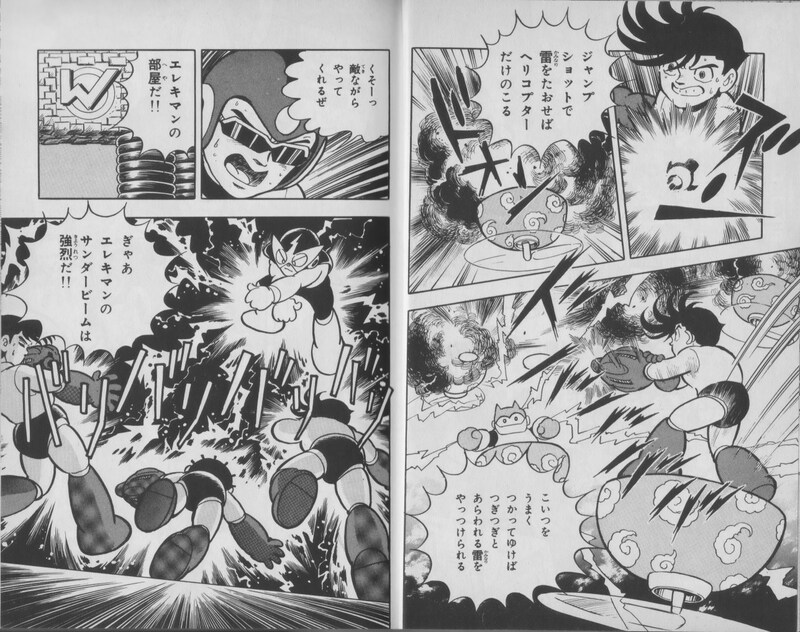 Then Elec Man reminds them of the awesome cheapness that is the Thunder Beam. Z-z-z-z-zap! Etc. 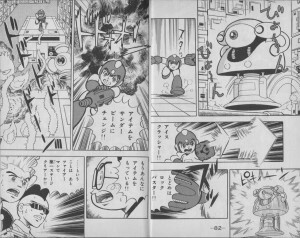 While Elec Man is distracted shocking the good guys, the Unknown Soldier P2 Bit Bender swoops in with Rolling Cutter and takes him out, claiming the Thunder Beam for himself and once again proving everyone on the good guys’ side (other than the main character) to be mostly useless. More bad news: The Benders’ evil plan has worked, and they have now cleared all four stages. D’oh! Now, to clear those two bosses with the regular arm cannon, that does take some skill. I must give these fictional characters props for that. They would have been heroes at my elementary school for pulling that off. But since they’re the bad guys, I suppose we shouldn’t be celebrating their skills so much as fearing the edge they’ve acquired. Things are looking grim for the Rock’n Gamers. But wait! Where’s Hajime been all this time? 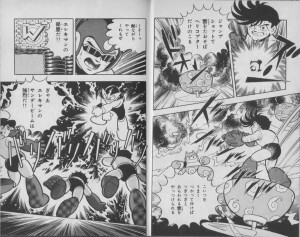 In the time it took each of the bad guys to clear one stage apiece, Hajime has blown through two stages and is working on a third. How’s he do it? 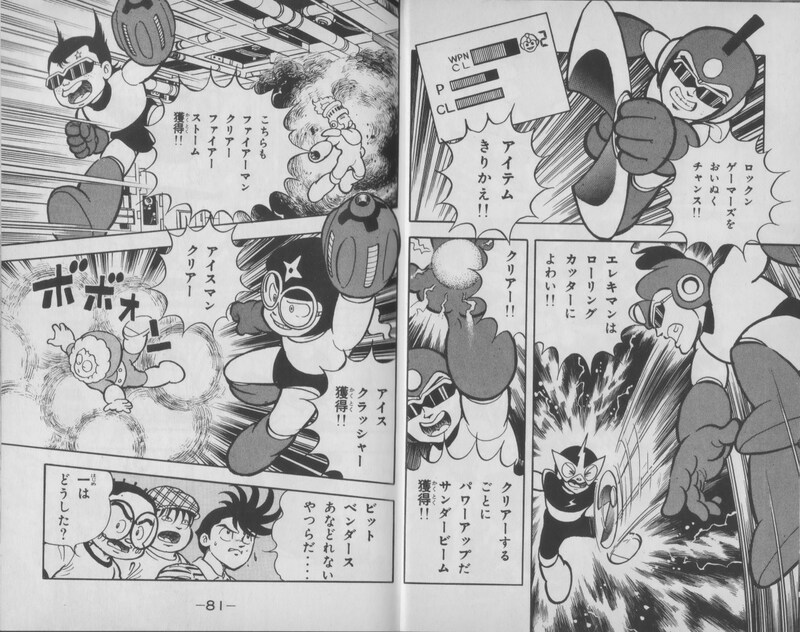 By using all the weapons he’s acquired like a pro (like “Ice Crusher” — for some reason a lot of Japanese materials tend to get that name wrong) to get through the stages faster. Special weapons: Not just for bosses anymore! The Benders are really starting to sweat now. If they lose this challenge, their superiors back at BUG aren’t going to be too happy with them. They might even loose their places at the “cool” lunch table. It’s all on the line now! With Fire Man off the burner, the playing field is all caught up. Looks like there’ll be a showdown at castillo de Wily. And if the Bit Benders want to win, they’re gonna need a miracle… or y’know, more cheating. Too bad BUG never invested in a Game Genie. Next time, the drama heats up as BUG strikes BACK! 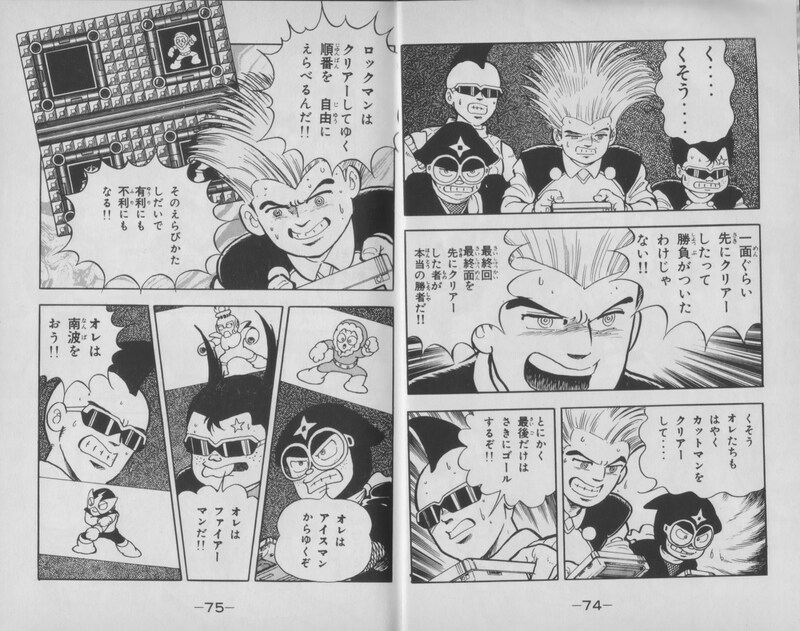 3 Comments to "ROCK’N GAMERS vs BIT BENDERS"
I was gonna say “HighHeels McEightiesHair didn’t get zapped in that panel; plot point?”, but then it looks like about half of them are missing anyway. :/ Am I just derping out, or did it actually say where the other two went? Good eye. By this time in the book, most of the Rock’n Gamers are just minor supporting characters that tend to flit in and out of the limelight. There’s generally one or two chapters where each was really important, and for the rest of the story they stand in the background and pop up when it’s convenient, or to make the bad guys seem tougher, or just remind the audience they still exist. Sorry to say, whatever they’re doing off-panel usually isn’t important. 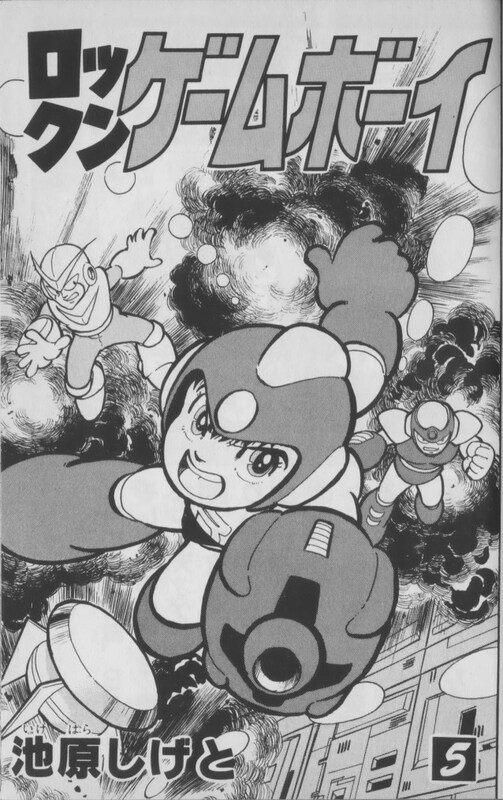 Great, now I have the music from Mega Man 2 (GB) stuck in my head. 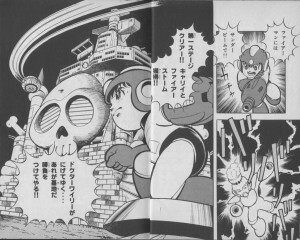 Kudos to the author for this Wily castle art, that one looks surprisingly accurate and detailed! « Glyde’s Favorite Subject: Glyde!